Planning chiefs have given final approval to plans for up to 325 houses to be built at Spofforth Hill. After months of wrangling between councillors on the plans panel at Leeds City Council (LCC), the last word on the application entered in July 2013, has been given by officers. The decision was delegated to them by the plans panel in October 2014 and this month approval was given to the outline application. LCC executive member for planning Coun Peter Gruen (Lab) said: “The fact that the decision is controversial for people who live around Spofforth Hill I recognise, but that doesn’t make it invalid. “The decision the panel made was to say in most of Leeds we seem to achieve 15 per cent affordable homes, so we have left 15 per cent on site at Spofforth Hill but any excess of that we have deemed it to be fair to redistribute that into housing growth in the city. In September, councillors voted in favour of the development in principle, on the understanding that Bellway would provide further details on several outstanding matters. These included the delivery of the £8.5m commuted sum in place of 20 per cent more affordable housing on the site, the proposed right hand turn lane giving access to the site, and the pepper-potting of the 49 affordable houses around the site. It was agreed previously that Bellway would begin developing the site this time next year, building around 50 houses a year. The commuted sum will be delivered in fifths as each set of 50 houses are built. Several hundred objections were submitted against the plans and a protest group was set up to oppose the plans. 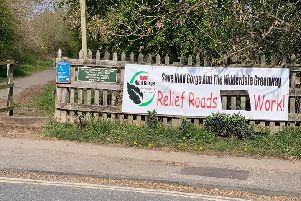 Establishing a legal fund for the prospect of a judicial review to oppose this eventual approval, the group has now decided the fight against the application is effectively over. On Tuesday they applied for LCC to help fund a judicial review but this has been deferred until after the election, which would be too late for the High Court. Group member Jim Walton said: “It is disappointing because LCC doesn’t seem to have been prepared to listen to any point of any information. Applicants Bellway Homes was asked to comment but did not provide one.